More than 500 customers in University City were without water for about nine hours overnight after a broken pipe led city crews to find a leaking water main, but service was restored Tuesday morning as crews fixed the leaking main and worked to repair the ruptured pipe. The 10-inch-diameter pipeline broke open about 3:30 p.m. Monday, sending recycled water gushing across Regents Road near Nobel Drive, city spokeswoman Arian Collins said. 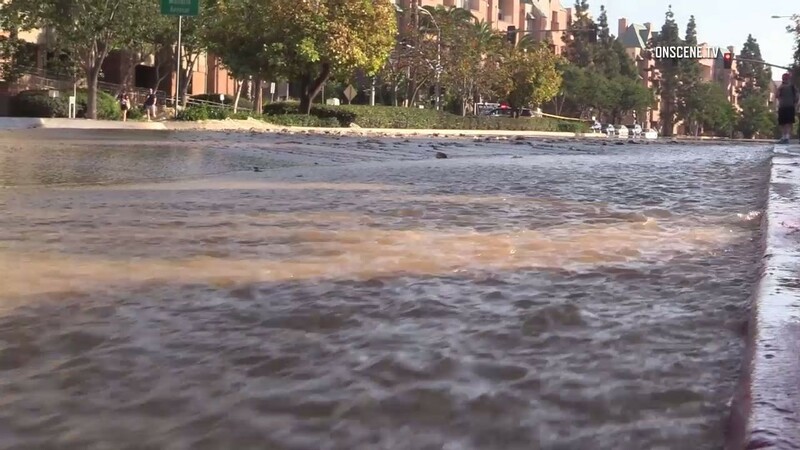 The flooding led to detours and traffic tie-ups in the busy retail-residential district east of La Jolla, including the closure of a three- block stretch of Regents Road. The initial break in the pipeline did not affect drinking water for customers as the recycled water that gushed from the ruptured pipeline was approved only for irrigation, manufacturing and other uses that rely on non- potable water, Collins said. But while fixing the pipeline, public works crews discovered a leak in a nearby 16-inch-diameter concrete water main. That main was shut down at 9:40 p.m. Monday, leaving between 500 and 600 customers in neighboring apartment complexes without water overnight. “Water wagons are on site to provide customers with water for drinking, cooking and other needs,” Collins said in a statement late Monday. The water main leak was repaired and service restored to the apartment complex at 6:40 a.m. Tuesday, Collins said. Crews were still working Tuesday morning to repair the ruptured recycled water pipeline.